Current mathematics reform has encouraged the use of computers in learning and teaching mathematics. Recent research also provides strong evidence of the usefulness of computers in mathematics learning. National surveys, however, indicate that computers are not being used by teachers in mathematics classrooms. A survey study was conducted to investigate the extent in which computers were being used by middle and high school mathematics teachers in the state of Missouri. Moreover, it was intended to develop an understanding of the basis for teachers' decisions regarding the use of computers, or lack of, in instruction. The data indicated that the teachers did not use computers for purposes other than drill and practice. This was due to lack of adequate knowledge about when and how computers could be used in mathematics instruction, and lack of sufficient training. Mathematics teacher educators, then, need to help increase teachers' knowledge about the usefulness of computers by engaging them in extensive experiences with computers and a variety of educational software. Teachers also need to be assisted in building curricular models that integrate the use of computers. Manoucherhri, A. (1999). Computers and School Mathematics Reform: Implications for Mathematics Teacher Education. 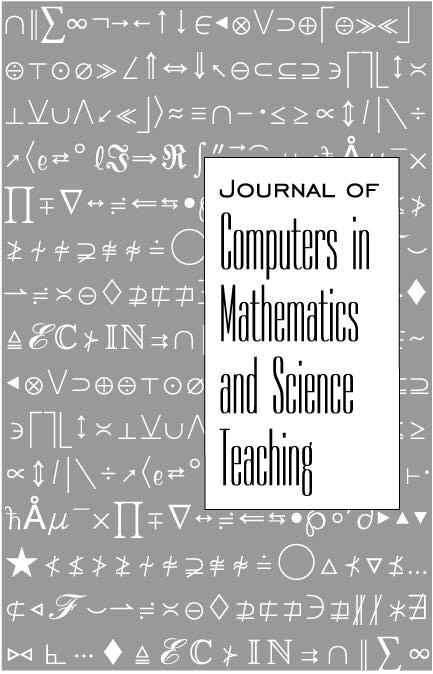 Journal of Computers in Mathematics and Science Teaching, 18 (1), 31-48. Charlottesville, VA: Association for the Advancement of Computing in Education (AACE). Retrieved April 21, 2019 from https://www.learntechlib.org/primary/p/8893/. Ball, D.L. (1988). Research on teacher learning: Studying how teachers’ knowledge changes. Action in Teacher Education, 10(2), 17-24. Becker, H.J. (1988). The impact of computer use on children’s learning: What the research has shown and what it has not. Center for Research on Elementary and Middle Schools, John Hopkins University, Baltimore, MD. P .C . (1992) . To teach mathematics for conceptual or procedural knowledge? : A dilemma of learning to teach in the ‘New World Order’ of mathematics education reform. Journal for Research in Mathematics Education. Brown, C.A., & Baird, J. (1992). Inside the teacher: Knowledge, beliefs and attitudes. In P.S. Wilson (Ed.) , Research ideas for the classroom: Highschool mathematics (pp. 245-249). Res ton , VA: National Council of Teachers of Mathematics. Brown, S., Cooney, T.J., & Jones, D. (1990). Mathematics teacher education. In W. R. Houston (Ed. ), Handbook of research on teacher education (pp. 469-497). New York: Macmillan. Cruickshank, D., & Metcalf, K. (1990). Training within teacher preparation. In W.R. Houston (Ed.) , Handbook of research on teacher education (pp. 469-497). New York: Macmillan. Dreyfus, T. (1992). Aspects of computerized learning environments which support problem solving . In J P . Ponte , J .F . Matos , J .M . Matos , & D . Fernandes (Eds. ), Mathematical problem solving and new information technologies: Research in context of practice (pp. 255-266). Berlin: Springer Verlag. Dugdale, S. (1992). The design of computer based mathematics instruction. In J.H. Larkin & R.W. Chabay (Eds. ), Computer-assisted instruction and intelligent tutoring systems: Shared issues and complementary approaches (pp. 11-45). Hillsdale, NJ: Erlbaum. Dreyfus, T. (1990). Advanced mathematical thinking. In P. Nesher and J. Kilpatrick (Eds. ), Mathematics and cognition: A research synthesis by the International Group for the Psychology of Mathematics Education (pp. 113134). New York: Cambridge University Press. Mathematics in the 1990’s (212-222). Res ton , VA: National Council of Teachers of Mathematics. DiSessa, A.A. (1988). Knowledge in Pieces. In George Forman& Peter B. Pufall (Eds.) Constructivism in the Computer Age (49-70). H i l lsda le, NJ : Lawrence Erlbaum. Hoyles, C. (1991). Developing mathematical knowledge through microworlds. In A.J. Bishop, S. Mellin-Olson, & J. Van Dormolen (Eds. ), Mathematical knowledge: Its growth through teaching (pp. 147-172). Dordrecht: Kluwer Academic. Jiang, Z. (1993). Students’ learning of introductory probability in a mathematical microworld. Unpublished doctoral dissertation, The University of Georgia. Joyce, B. (1988). Training research and prospective teacher education: A reconsideration. Journal of Teacher Education, 39(5), 32-36. Kulik, J.A., & Kulik, C.L.C. (1987). Review of recent research literature on computer-based instruction. Contemporary Educational Psychology, 12, 222-230. Lehning, H. (1987). Computers as mathematical problem solving assistants. In R. Lewis, & E.D. Tagg (Eds. ), A computer for each students (pp. 135-140). North Holland: Elsevier Science Publishers. Manouchehri, A. (1994). Computer based explorations and mathematical thinking processes of preservice elementary teachers: Two case studies. Unpublished doctoral dissertation, The University of Georgia. Mathematical Association of America (1991). A call for change: Recommendations for the mathematical preparation of teachers of mathematics. Washington, DC: Author. Mathematics Sciences Education Board (1991). Counting on you: Actions supporting mathematics teaching standards. Washington DC: National Academy Press. National Council of Teachers of Mathematics (1989). Curriculum and Evaluation Standards for School Mathematics. Reston, VA: National Council of Teachers of Mathematics. National Council of Teachers of Mathematics (1991). Professional Standards for Teaching Mathematics. Reston, VA: National Council of Teachers of Mathematics. Niemiec, R.P., & Walberg, H.J. (1987). Comparative effects of computer assisted instruction: A synthesis of reviews. Journal of Educational Computing Research, 3, 19-37. Office of Technology Assessment. (1988). Power on: New tools for teaching and learning. Washington, DC: U.S. Government Printing Office. Owens, E.W. (1993). Technology access and use in urban, suburban, and rural eighth grade mathematics classrooms. In D. Carey, D.A. Willis, & J. Willis (Eds.) , Technology and teacher education annual 1993 (pp. 528-530). Charlottesville, VA: Association for the advancement of Computing in Education. Palmiter, J.R. (1986). The impact of a computer algebra system on college calculus . Unpublished doctoral dissertation, The Ohio State University. Park, K. (1993). A comparative study of the traditional calculus course vs. The Calculus & Mathematics. Unpublished doctoral dissertation, University of Illinois at Urbana-Champaign. Tall, D. (1986 ). Building and testing a cognitive approach to the calculus using graphics. Unpublished doctoral dissertation, Warwick University, Coventry. Wachsmuth, I., & Becker, J. (1986). The role of technology in the cognitive development of mathematics learners. Journal of Mathematical Behavior, 5, 209-232. Weissglass, J. (1994). Changing mathematics teaching means changing ourselves: Implications for professional development. In D.B. Aichele (Ed.) Professional Development for Teachers of Mathematics . (67-78) . Reston, VA: National Council of Teachers of Mathematics.